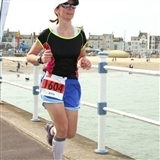 Run Together Wimbledon is a running group established in January 2017 in Wimbledon by health & wellness coach Anna Desogus. We don't do steady continuous runs - you can do them on your own! We do fun sessions with various elements and keep it exciting and challening! There is always a warm up with some drills to improve your running form, balance & coordination. There are also some games to keep it interesting and develop agility. You will be motivated to push outside your comfort zone, but don't worry, there will be breaks to catch your breath too! Sessions are specifically designed for a mixed ability group, so that both slower and faster runners can train together. It is possible! How? Let me give you an example. If in the main part of the session we do repetitions of a set loop, more experience runners will aim for a higher pace and more repetitions, while beginners will be working at their own pace and completing a smaller number of repetitions. So it is kind of personalised training, yet we all train together, which is great! PARTICIPANTS OF ALL LEVELS WELCOME! Click on the OUR RUNS page to see all details of our upcoming sessions. Our sessions offer a dynamic workout that will make you feel great and will help you build running fitness no matter whether you are a beginner preparing for your first 5K or a more experienced runner looking to add some variety to your training. Also, check out our TESTIMONIAL page to see what runners have been saying about the group and how they feel after the sessions. Any questions - please get in touch!